This t-shirt has long sleeves and a warm roll neck. 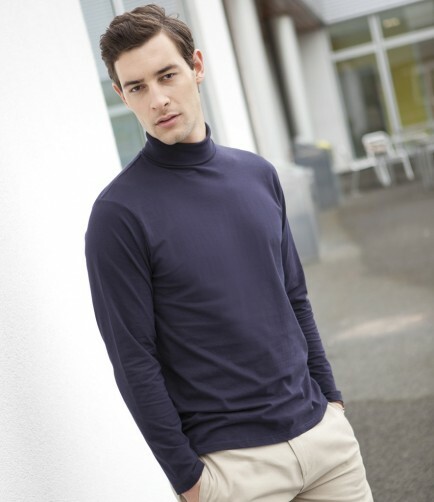 The Henbury H020 Long Sleeve Roll Neck Top in 96% Cotton/4% Elastane single jersey. Double thickness stretch rib roll neck. Reinforced shoulders and neck. Twin needle stitching. Hemmed cuffs. The Henbury H020 Long Sleeve Roll Neck Top has a fabric weight of: 190gsm. S fits 36" chest,M fits 38 - 40",L fits 42",XL fits 44 - 46",XXL 48"